To borrow from Trey Amos, “The Art of the Natural” finally arrived this week at the Virginia Quilt Museum in the form of 177 small quilts. These are not your grandmother’s quilts – they are art quilts, an art form born of the 1960s return to the earth and old ways, when people realized a new-found respect for a craftsman’s creative skills. These 177 art quilts are collectively known as “Inspired by the National Parks”. “Inspired” here does not mean a decorated copy. Nor are art quilts created from a pattern. They are fiber art built upon an original experience, idea, or imagery, using quilting techniques. The collection developed from a 2014 challenge put out to quilters by Donna DeSoto, a member of the Fairfax, VA chapter of Quilters Unlimited. Since her previous “Inspired by the Beatles” challenge had been so successful, she asked participants to select a National Park and make a quilt to honor either its flora, fauna, or landscape. The response exceeded her hopes and dreams! The resulting exhibit debuted at the Houston International Quilt Festival in Fall 2015 and has shown at a few venues since. The quilts traveled safely here from Lake Roosevelt National Recreation Area at Coulee Dam, WA, where they had spent the July 4th weekend on display. 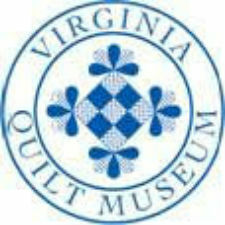 Now they are expertly installed in their new space by Gloria Comstock, the Virginia Quilt Museum’s curator. She had carefully trained a crew of Museum volunteers in the care and handling of such a precious commodity. “On Thursday, the last few, in the bay window, were fitted together like pieces of a puzzle,” she explained, “but we got it!” The collection will now receive visitors in Harrisonburg through September 10. Some of this exhibit’s quilters are internationally known, others are novice quilters, but they all share “a passion for American’s Best Idea: The National Parks,” according to its website. If you’ve been to that park, you can reminisce. If you haven’t, you can dream of going. Barbara Roadcap, the Museum’s events coordinator commented, “The Parks exhibit is fantastic – I wish the world could see this!” And, as they say, seeing is believing! “Inspired by the National Parks” national tour schedule can be found at its website www.npscentennialquilts.com. For information or details about the exhibit, visit www.vaquiltmuseum.org.